John Battelle's Search Blog Get Out of Your Office, And Into The Modern Working City: OpenCo SF Is Live! Get Out of Your Office, And Into The Modern Working City: OpenCo SF Is Live! I’m bustin’ with pride to announce that after great festivals in London, New York, and Detroit, OpenCo is returning next month to its home base of San Francisco, and the lineup is 135 companies strong*. For those who haven’t heard about it before, OpenCo is an “inside out” event – instead of going into a ballroom and hearing CEOs talk at you, you go to literally inside their companies, and interact with the people and the cultures that are changing our world. It’s a really cool idea, and it’s really, really a different experience. Oh, and it’s free. As in, no cost. Of course, it wouldn’t be a business if we didn’t have an upgrade from free: you can buy various levels of upgrades that get you early access to picking just the companies you want to visit – last year, many companies sold out the same week that the schedule picker went live. And guess what – the schedule picker is now LIVE! So….go register. If you upgrade to “Reserved” you’ll get early access to the picker – that’s just $95. 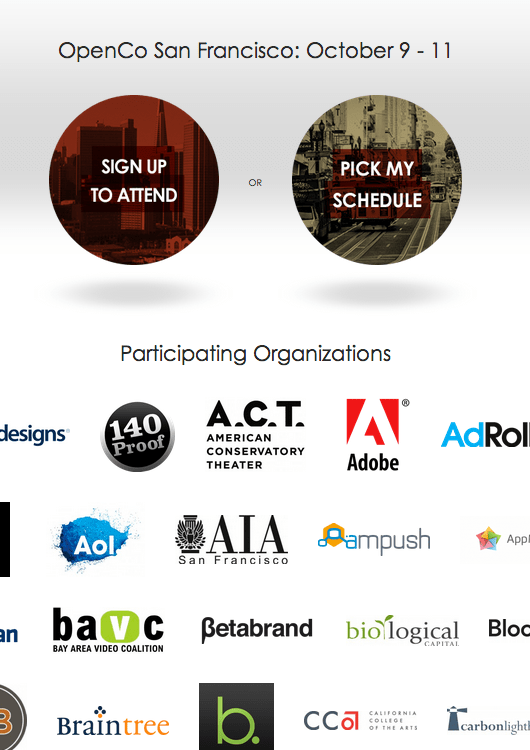 If you want to go to the Plenary, which is a VIP cocktail before the event kicks off, featuring Mayor Ed Lee, Ron Conway, Airbnb’s Brian Chesky, Rickshaw’s Mark Dwight, and more, well, that’ll cost more – a “Backstage” pass is $495. But you also get access to the picker right now, as in, first. General admission, you get to pick your companies at the end of this month. In any case, it’s a great event. I’m so proud of it, and I hope you’ll support it in any way you can**. The spirit of open communication, open collaboration, and the open Internet are alive and well and driving change and innovation in San Francisco. Come see it this October! * Host OpenCos include the American Conservatory Theatre, Cloudera, Code For America, Eventbrite, Github, Google, IFTTT, Jawbone, Nextdoor, Presidio Trust, Project Frog, Rickshaw Bags, Salesforce, Scoot Network, Sidecar, SVAngel, Wired and many more. ** Huge thanks to American Express OPEN Forum, Yahoo!, and the InterPublic Group of Companies, among many others, for helping make this possible.